Talheim has two rail-served industries. The machine factory and the saw mill. The machine factory has two tracks arranged in a V-shape with sure spots, i.e. the coal waggon always goes to the end of track 1, and a box car/sliding sides car gets spotted at the loading ramp of track 1. Track 2 has no loading ramp, but a loading door instead, so the car needs to be spotted at just the right place in front of the door, so workers can load or unload the car. There is enough space for two spots, so I might have two loading doors in the factory building here. As I worked the machine factory I realized, I used the toothpick to uncouple cars in various locations along both tracks, so both tracks need to remain accessible. Which means I have to rethink the building layout of having the tower and the administration building between track 2 and the operator (who would be at the bottom of above photo). However, I really like the visual appearance of this setup. Alternatively, I'm considering installing a remote controlled uncoupler at least on track 2 roughly between tower and main building. I might install another one near the loading ramp on track 1. BTW, the building flat on the left depicts another building of the factory, and I'm contemplating extending the track into the room wall, so I could spot a car into that "manufacturing hall" for loading with the ceiling crane. The saw mill has only a small stub track for rail shipping and delivery within the mill property which extends mostly outside the layout boundary. The track will need to be long enough for one long Rungenwagen, or two short flat cars. Operationally, this track is a bit more tricky to switch since it requires the locomotive to run around the car/train. 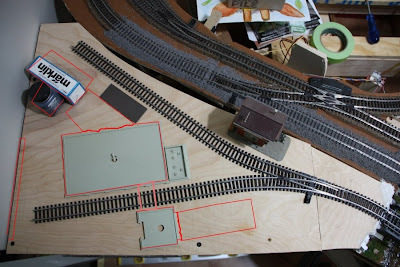 The siding connecting the sawmill stub track to the machine factory and the rest of the layout will double as my programming track, since it's right above the Intellibox command station and easily accessible.